What are we known for?. ◾Gradient density fuel strainer for superior contaminant filtration. It is your responsibility to make sure you are purchasing the correct item. Orders cannot be collected. ◾Designed for use with E85/ ethanol. Looking for an application specific intank fuel pump for your 600 whp build?. Look no further! 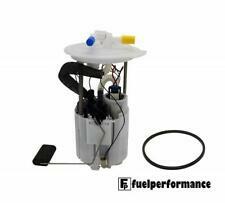 QFS 340LPH Intank Fuel Pump Kit. QUANTUM Flextech 340LPH. Slight Modification is required to your OEM Fuel Pump carrier in order to fit the 340LPH Fuel Pump OR See the Compact #QFS-344FT-GSI for a OEM Fit! Compatible with modern ethanol-infused pump gasoline. What are we known for?. Gradient density fuel strainer for superior contaminant filtration. OEM or better performance. Orders cannot be collected. The Compact is a high performance pump that bolts into many existing hanger assemblies making installation quick, Simple & Easy. This pump is ideal for applications requiring more flow while retaining the factory fuel lines. VAUXHALL ASTRA GSI & ASTRA COUPE. The Compact is a high performance pump that bolts into many existing hanger assemblies making installation quick, Simple & Easy. This pump is ideal for applications requiring more flow while retaining the factory fuel lines. VAUXHALL ASTRA & CORSA VXR. OPEL ASTRA & CORSA OPC. The Compact is a high performance pump that bolts into many existing hanger assemblies making installation quick, Simple & Easy. This pump is ideal for applications requiring more flow while retaining the factory fuel lines. Replaces 16147723464. Quantum Fuel Pump Strainer for BMW F650GS Dakar 2001-2007. What are we known for?. It is your responsibility to make sure you are purchasing the correct item. Orders cannot be collected. Flow: 380LPH @ 3Bar. 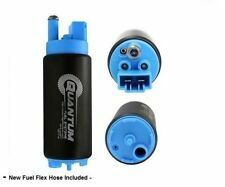 FEATURES: Quantum's 380lph high pressure fuel pump Pump for high performance EFI vehicles is now available. Quantum's' 380lph fuel pump is capable of supporting over 1,200 HP naturally aspirated and over 1000 HP in forced induction applications. Design: Intank. BMW-525I, 535I, 735I, 735IL, L7, M5 1993-1989. BMW L7 1986 - 1987 3.5L. BMW 735iL 1988 - 1992 3.5L. BMW 735i 1987 - 1992 3.5L. BMW 535i 1989 - 1993 3.5L. BMW 525i 1989 - 1990 2.5L. BMW M5 1991 - 1993 3.6L. 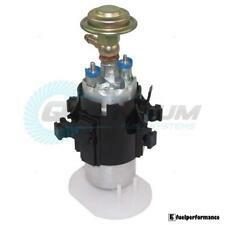 Looking for an application specific fuel pump for your 600 whp build?. Look no further! 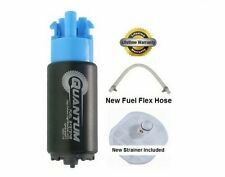 QUANTUM's NEW E85 Compatible Flextech 340LPH Fuel Pump Kit. Wiring pigtail designed to handle increased amperage draw of the 340LPH fuel pump, unlike competitors' wiring which includes thin/ unsafe 20 gauge pigtail. Looking for an application specific intank fuel pump for your 600 whp build?. Look no further! 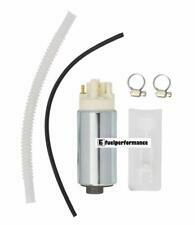 340LPH E85 COMPATIBLE Intank Fuel Pump Kit. QUANTUM Flextech 340LPH. Slight Modification is required to your OEM Fuel Pump carrier in order to fit the 340LPH Fuel Pump OR See the QFS-344FT Compact for a OEM Fit! Replaces BMW 16116755043, 16146758736. What are we known for?. 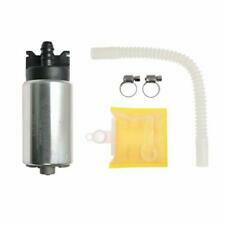 Range Rover Fuel Pump with Strainer 4.4L M62 V8 2003-2005 LR014301 NEW! Design: Intank Fuel Pump w/ Strainer. Part Number: HFP- 438. Orders cannot be collected. Gradient density fuel strainer for superior contaminant filtration. Compatible with modern ethanol-infused pump gasoline. What are we known for?. Specifically designed for quiet operation. OEM or better performance. 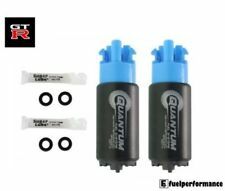 QUANTUM'sFlextech 340LPH E85/ Gasoline Compatible Fuel Pump Kit for Ford Mustang Bullitt 4.6L 2001. The Compact is a high performance pump that bolts into many existing hanger assemblies making installation quick, Simple & Easy. Looking for an application specific intank fuel pump for your 600 whp build?. Look no further! Our installation kits comprise of thick gauge wiring pigtails, and high quality 40 micron strainers. 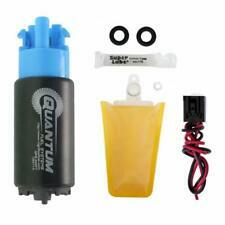 QUANTUM's NEW E85 Compatible Flextech 340LPH Fuel Pump Kit. Compatible with modern ethanol-infused pump gasoline. What are we known for?. Gradient density fuel strainer for superior contaminant filtration. Polished corrosion-resistant case to help minimize seizing during non-operation. Our installation kits comprise of thick gauge wiring pigtails, and high quality 40 micron strainers. 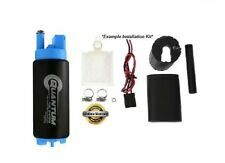 QFS 340LPH Intank Fuel Pump w/Install Kit 340 Fits Looking for an application specific intank fuel pump for your 600 whp build?. Compatible with modern ethanol-infused pump gasoline. What are we known for?. OEM or better performance. It is your responsibility to make sure you are purchasing the correct item. Orders cannot be collected. Looking for an application specific intank fuel pump for your 600 whp build?. Look no further! Our installation kits comprise of thick gauge wiring pigtails, and high quality 40 micron strainers. QUANTUM'sFlextech 340LPH. Compatible with modern ethanol-infused pump gasoline. What are we known for?. Patented check valve technology. Orders cannot be collected. OEM or better performance. It is your responsibility to make sure you are purchasing the correct item. 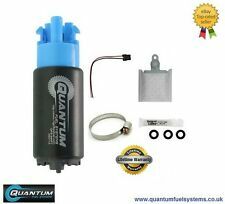 Quantum 340LPH Compact 65mm Fuel Pump & Install Kit fits: later model Subaru. 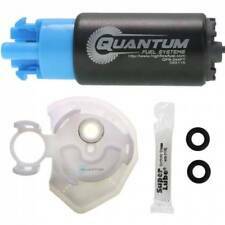 QUANTUM'sFlextech 340LPH Direct-Fit High Pressure E85 / Gasoline Compatible Fuel Pump Kit. Look no further! Wiring pigtail (included when necessary) designed to handle increased amperage draw of the 340LPH fuel pump, unlike competitors' wiring which includes a thin/ unsafe 20 gauge pigtail. Our installation kits comprise of thick gauge wiring pigtails, and high quality 40 micron strainers. Looking for an application specific intank fuel pump for your 600 whp build?. Look no further! Fuel Types: Compatible with gasoline or E85, although E85 may shorten lifespan (but will not void warranty). Our installation kits comprise of thick gauge wiring pigtails, and high quality 40 micron strainers. - MITSUBISHI EVO 340LPH -. QUANTUM'sFlextech 340LPH Fuel Pump Kit. Looking for an application specific intank fuel pump for your 600 whp build?. REPLACES OEM # 2521242, 2521327, 709000461, 709000758, 2204401, 2204402, 2204403, 2205469. What are we known for?. It is your responsibility to make sure you are purchasing the correct item. Orders cannot be collected.